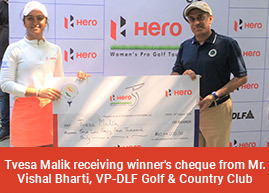 Hyderabad, August 24: Tvesa Malik played a very steady back nine and rallied from a four-shot deficit to tie with Amandeep Drall and then beat the latter in the play-off to win the 12th Leg of the Hero Women’s Pro Golf Tour. This was the second play-off this season, the first being in the second leg at BPGC, Mumbai when Sharmila Nicollet beat Neha Tripathi. Tvesa, who won the fourth leg, but has also had a series of second place finishes, began the final round three shots behind the leader and in-form Amandeep Drall. Tvesa, playing in the final grouping alongside Amandeep and Sonam, opened the day with a birdie but all three players bogeyed the Par-4 second, which played very difficult on Friday. As Tvesa dropped a shot on sixth, Amandeep picked a birdie on seventh and extended her lead to four shots. Meanwhile, Sonam with a three-over 38 on front nine, slipped back and out of contention. Amandeep and Tvesa started the back nine with a bogey each. Amandeep showed first signs of cracking on the 12th, which she bogeyed and allowed the gap to reduce to three. She again bogeyed the 13th, which Tvesa birdied for a two-shot swing and suddenly the gap was just one. Tvesa steadily holed out pars from the 14th to 18th, while Amandeep dropped another shot on the Par-4 16th. With neither managing birdies on the last two holes, they were tied at 4-over 220 and went into a play-off. The first play-off saw both bogeying and off the second, both parred. They then went into the third play-off. This time Tvesa held her nerve and won as the play-off was on hole number two. Sonam Chugh, who was two behind the leader and lying second after the second round, ended a distant third after falling to 79 in the final round. Suchitra Ramesh (76) was Tied-4th with amateur Sneha Singh (76), while Millie Saroha (77) was sixth. The win also ensured Tvesa stayed on top of the Hero Order of Merit as Amandeep moved to second, up from third before this leg. Tvesa also became the first to cross one million rupees this season, as she took her total to Rs.1,093,400, while Amandeep has Rs.852,200 and Neha has made Rs.830, 200.